When the students enter the principal’s office, their admiration for their principal and school is palpable. 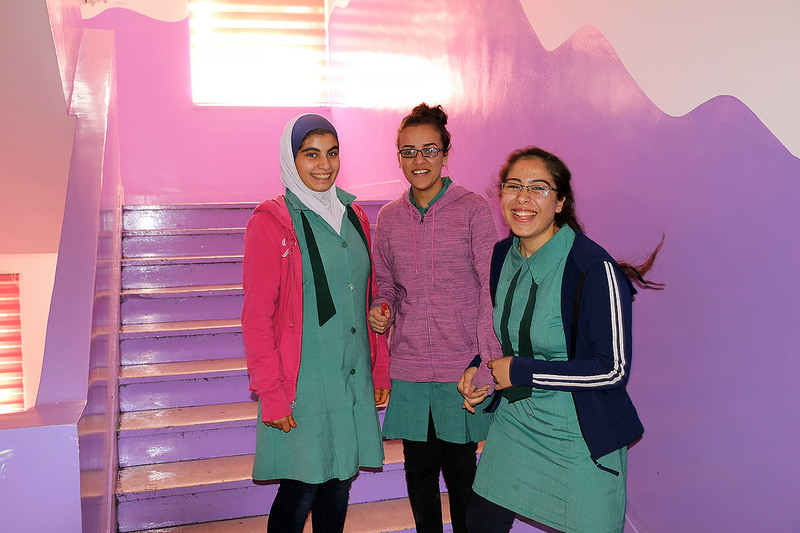 “We are so proud of how beautiful our school is, and we are much more motivated to learn here,” explains 17-year-old Majd, who has been a student in the girls’ school since kindergarten. 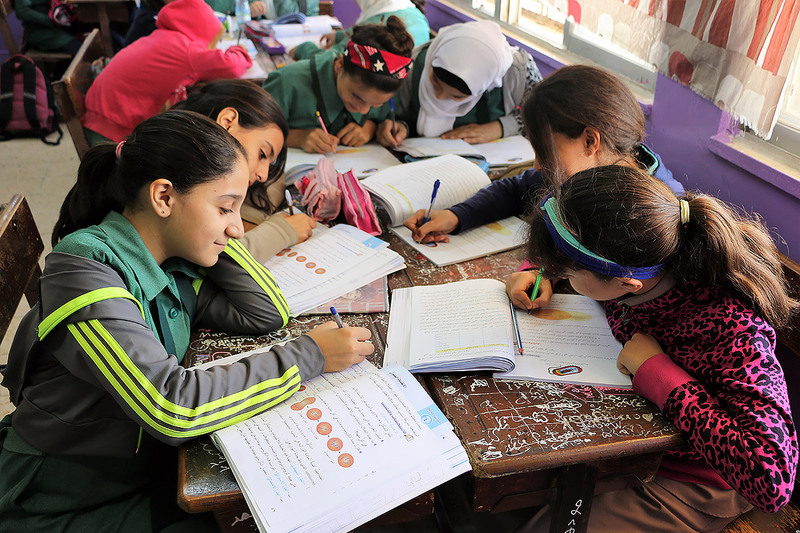 Bint Adi Secondary School for Girls in Jordan is one of 75 schools which has been rehabilitated by The Lutheran World Federation (LWF) during the past years. Until 2019, an estimated 27,750 students will directly benefit from new and improved schools in the country. 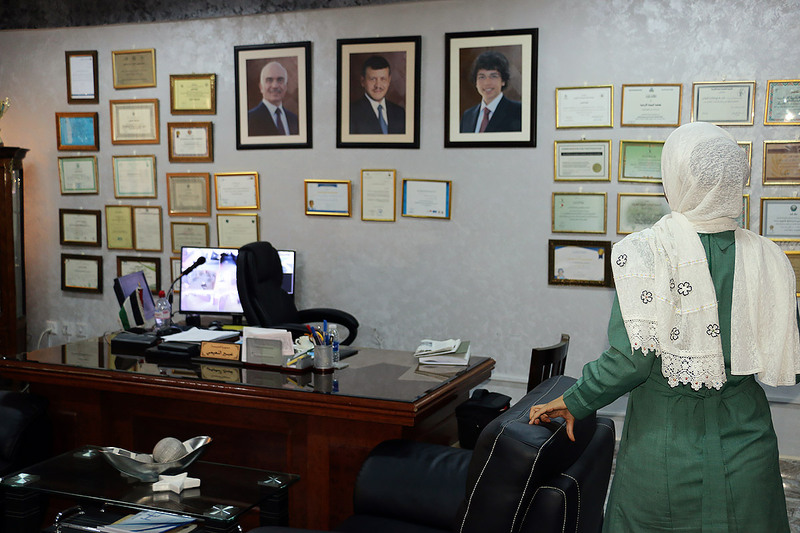 A student in the principal’s office of Bint Adi Secondary School for Girls. As the Syrian civil war continues and fighting has started again in Iraq, Jordan remains one of the main countries hosting refugees in the Middle East. According to the United Nations, in September 2017 Jordan hosted more than 650,000 refugees from Syria alone. More than half of them are children, many of schoolgoing age. The refugee children have been taken in by the Jordanian school system. In many schools they are taught in two shifts in the morning and afternoon. Rehabilitating schools in poor conditions and providing extra classrooms is therefore critical for refugees and host communities alike. 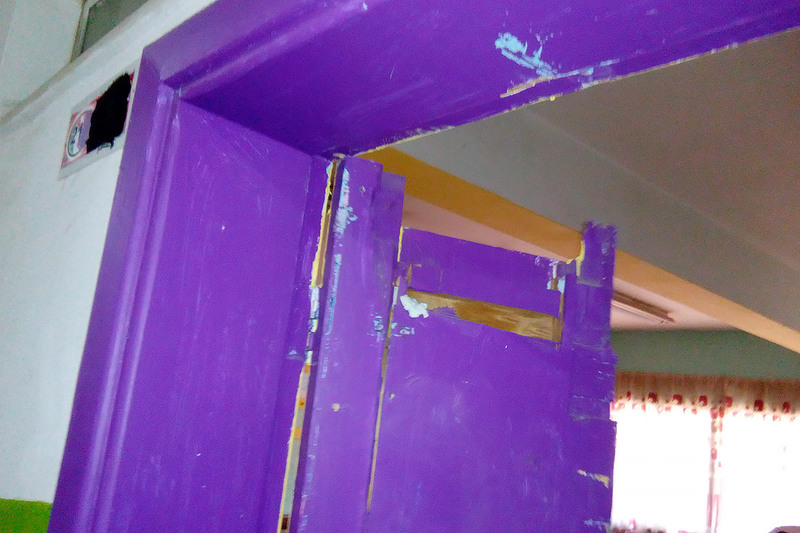 Before and after: A broken door to a classroom before the school was rehabilitated. Pictures show how the girls’ school looked before: Broken doors, paint flaking off the walls, old desks. Not even the image of the ruling monarch King Abdullah, obligatory in public buildings in Jordan, was hanging properly anymore. 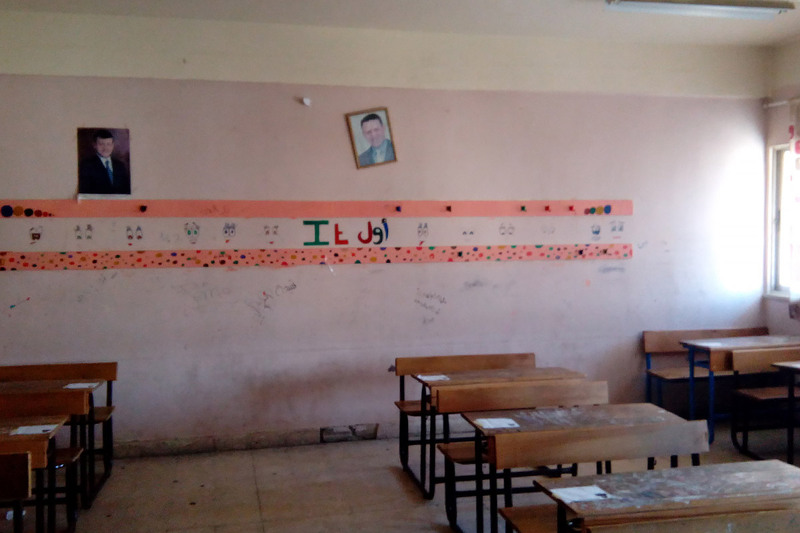 Before and after: A classroom before the school was rehabilitated. Today, the walls have been painted and the doors repaired. A stroll through the grounds reveals freshly painted pastel walls, a cozy refurbished library, newly installed classroom doors, and aesthetic displays of student art. After renovation, the school displays student art. The students appreciate what has been done, and take good care of the building. When the bell rings to announce a break between classes, students help the custodial staff tidy the bright hallways. When Majd is not studying for her university entrance exams—she hopes to become an optometrist— she and her friends love to decorate their classroom and help to keep the school clean. The rehabilitation includes teacher training to promote new teaching methodology. 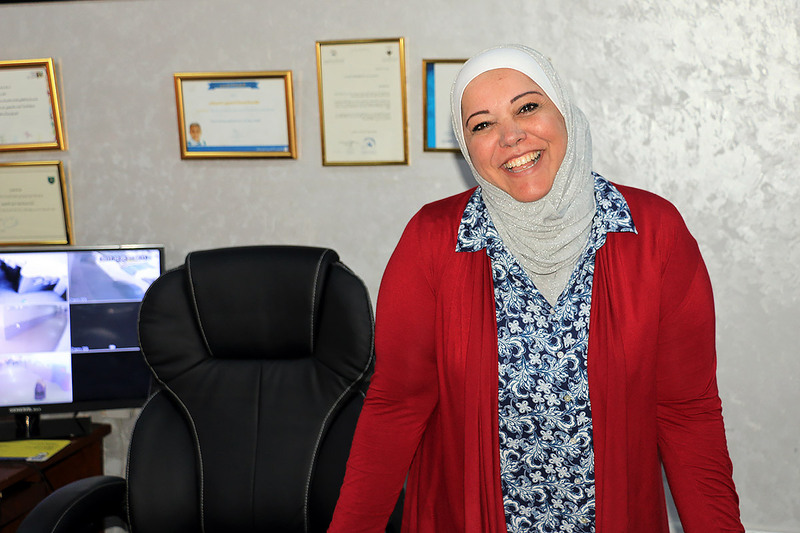 Principal Abeer Al-Muhaisen has observed a different teaching atmosphere since the school rehabilitation was started. Until 2019, LWF plans to rehabilitate 75 schools, benefitting 27,750 students directly. The project is funded by Canadian Lutheran World Relief (CLWR) with the financial support of the Government of Canada provided through Global Affairs Canada. Please support LWF’s work in Jordan.